Are you looking for purchase management software to extend and improve your finance system? Proactis is a comprehensive solution to all your purchase-to-pay and procurement needs. LAKE solutions based on Proactis offer more in terms of ease of use, market leadership, breadth of the solution and superior service. Proactis solutions reduce corporate spend by automating and streamlining the entire day-to-day buying process, from request through authorisation, ordering, invoice processing, and payment via Accounts Payable. Proactis solutions ensure that more of your organisation's purchases can be channelled towards the best suppliers and prices that deliver significant savings. The new Marketplace option delivers simple one-click access to rich procurement content based on approved catalogues, contracts and punch-out links from over 2,000 suppliers. Proactis Purchase-to-Pay helps you manage the complete buying cycle from expression of need to approval of payment. It simplifies purchasing while ensuring compliance with sourcing, authorisation, and financial controls. 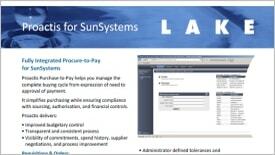 LAKE accounts payable automation solutions improve the efficiency and accuracy of handling inbound documents. This includes workflow to streamline data capture, invoice registration, matching and approval, and delivering a more efficient method of document storage and a simpler means of retrieval. Automatically capture images and extract, process and retrieve data from paper or electronic documents to speed up the processing of supplier invoices. Use the latest intelligent OCR technology to extract and process data, significantly reducing the cost of processing invoices and other incoming business documents. Employees at all levels need to buy goods and services. In many organisations, submitting expense claims is a manual effort involving a mixture of paper forms, emails and spreadsheets. The process is slow; it lacks controls and provides poor visibility for all concerned. Proactis Expenses helps you improve control of purchase claims. Employees will readily embrace it as the easiest way to expedite a reclaim of monies spent while following the established policies and procedures. Proactis procurement solutions provide a framework of sourcing, contract, catalogue, and supplier management capabilities that enable you to leverage your organisation’s full buying power, gain best value agreements, and maximise the percentage of “spend under management” across all categories of spend. Good suppliers are an important asset to any organisation and are crucial to facilitating what an organisation does. Each supplier represents a relationship that needs to be nurtured with a risk profile that needs to be managed. Collecting and maintaining accurate, up-to-date information is crucial to maintaining a clear picture of current and potential suppliers, while ongoing two-way communication is vital for relationships. Proactis Supplier Management allows organisations to be more proactive in how they collaborate with suppliers to achieve best value and compliance. Proactis offers a range of solutions to help control, manage and streamline the supplier engagement process. For organisations looking to drive best value, a clear definition of product and service requirements and the right choice of supplier are critical. This applies to all types of Spend, whether it's for one-off capital purchases, project related items, or ongoing supply of particular goods or services. The process of sourcing goods and services and evaluating suppliers against requirements can be complex and time consuming. Furthermore, and it is often necessary to prove compliance and show that a fair and methodical approach has been taken. Proactis eSourcing helps procurement departments to improve the effectiveness and transparency of the sourcing process while dramatically reducing administration time and effort. It combines the sophistication required to handle the most complex tendering project with a simple, intuitive user experience that guides even occasional users through the correct process. The solution provides a flexible, collaborative and efficient method for electronically developing and publishing all types of requests to suppliers such as simple RFQs, framework agreements, reverse auctions and complex Official Journal of the European Union (OJEU) tenders. It enables a structured, transparent and easily tracked process, from expression of need, through acceptance and evaluation of suppler responses, to final contract award. Purchasing professionals work hard to identify the best suppliers and negotiate best value agreements. These contracts lock in terms for use by the organisation. When colleagues spend "off contract", perhaps because contracts are not available or apparent, advantages are lost. Furthermore, organisations will be at risk if contracts expire or if either party fails to comply with contract provisions. Proactis Contract Management solves these challenges with a central electronic repository. This enables organisations to realise full benefits from supplier contracts, providing clear visibility to all users and allowing Contract Managers to manage key dates, events and service level agreements (SLAs). User adoption has added importance for finance teams rolling out systems across their organisation. 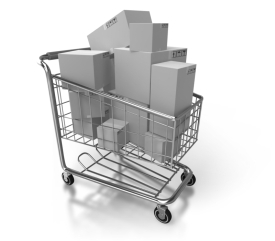 Purchasing or procurement systems that are easier to use help smooth the transition to a new way of working. Proactis is consistently rated highly by leading international consultancies ( see CapGemini and Gartner announcements in our news section) and is acknowledged for its market leadership in the UK Public Sector. UK based Proactis Group is main sponsor and keynote speaker at eWorld Purchasing & Supply. Proactis software is trusted by 1,000 enterprises and over 2 million suppliers. Proactis offers users of SunSystems a comprehensive range of options and modules unmatched by rival systems. In addition to features you might expect such as reporting via Infor Q A and dashboards, real-time budget checking and workflow management, there are options for document scanning, purchase card management, sales invoicing and inventory and more. 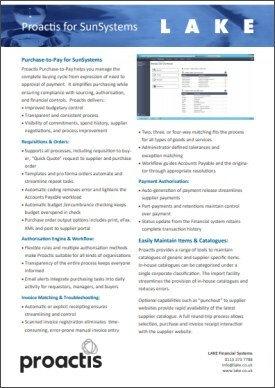 The range of Proactis solutions spans Purchase-to-Pay, Expenses, Accounts Payable Automation, Contract Management, eSourcing / eTendering and Supplier Engagement.